On February 1, 1965, President Johnson announced the launching of a “nationwide job development program.” The following day, Senator Joseph S. Clark (D-PA) introduced S. 974 that provided for an expanded federal jobs training program to address an unemployment rate that averaged 5.8% between 1961 and 1964. 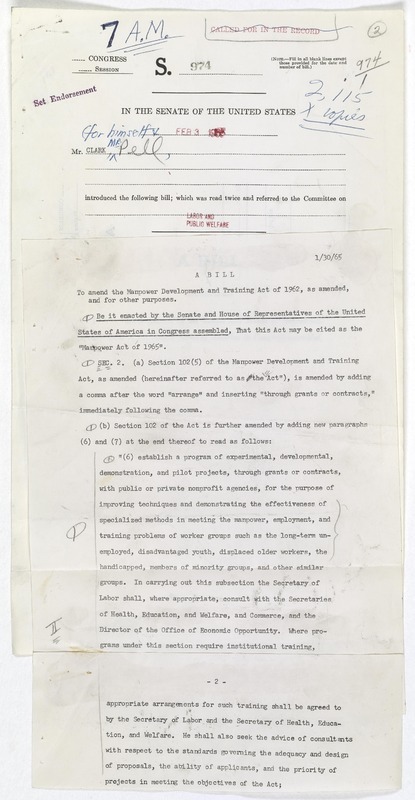 Legislation to reduce unemployment enjoyed wide bipartisan support and a slightly amended S. 974 passed the Senate on March 16, 1965, by a vote of 76 to 8. A companion House bill, H.R. 4257, passed the House of Representatives on April 1 by a vote of 395 to 0. On April 26, the president signed into law the Manpower Training Act of 1965.